Synthroid vs Levothyroxine: Should you Switch Thyroid Medications? →Synthroid vs Levothyroxine: Are these Medications Interchangeable? Synthroid vs Levothyroxine: Are these Medications Interchangeable? Even though Synthroid and Levothyroxine contain the same active ingredient, they may not be tolerated equally among all patients. This means that certain patients do better on one medication compared to the other! The most common medication used to treat hypothyroidism is Levothyroxine. Levothyroxine is considered a "generic" version of the thyroid medication Synthroid. But is there a difference and does it actually matter? The answer is yes, there may actually be a difference despite these medications being almost exactly the same. Generic medications are usually created after a brand name medication goes off patent. Other pharmaceutical companies can then come in and make a "me too" version of the medication and they often sell it for cheaper than the original. In this case, we have Levothyroxine which is the generic and Synthroid which is the brand name medication. But despite both of these medications having the exact same ACTIVE ingredient (thyroxine) (1), they are not the EXACT same. And even though the difference is not big, it may actually matter to certain people (especially those who are sensitive). The active thyroid hormone and the active ingredient in both medications is the thyroid hormone Thyroxine. Thyroxine is the bio-identical pharmaceutical version of the T4 thyroid hormone that your body produces naturally. Both Synthroid and Levothyroxine contain this active ingredient. So we know that the difference between these medications probably has little to do with the active ingredient and more to do with the inactive ingredients. Inactive ingredients are known as fillers, dyes, and binders which help hold the active medication in place. All pharmaceutical medications have inactive ingredients and these ingredients can help delay the absorption of medications, protect the ingredients from damage in the intestinal tract and so on. The problem is that some of these medications contain ingredients that may actually cause negative symptoms and reactions in certain sensitive patients (2). It is this small difference that may account for the difference in bioequivalence seen between generic and brand-name levothyroxine in some studies (3). This study showed that using Synthroid resulted in a more rapid rise in total serum triiodothyronine and a higher peak serum T3 when compared to other T4 only products. And even though this result didn't reach statistical significance, it may still be important for certain people. Remember that T3 is the most active and potent form of thyroid hormone in your body (4). So even small changes to T3 may have a big impact on certain individuals. It may be small differences such as this which result in improvement when switching from one medication to the other, even though technically they are the "same thing". And this isn't the only study to show a difference between these medications. Another study, which evaluated children with hypothyroidism, showed that Synthroid resulted in a significantly lower TSH when compared to generic LT4 medication replacement therapy (5). 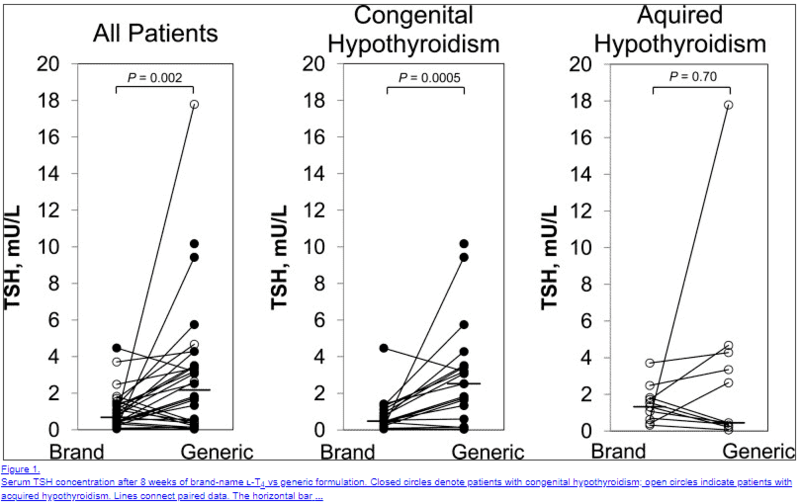 What is interesting is that the people who seemed to be sensitive to the difference were only patients with certain types of hypothyroidism (congenital hypothyroidism in this case). What this tells us is that not all patients are equally responsive to all types of thyroid medications (which shouldn't come as a surprise). This is a potentially big issue because most physicians, when prescribing medications, often recommend the cheaper generic alternatives to the name brand medications. To further complicate this, some pharmacists can even alter medications given to patients for insurance and cost purposes. While this may be a strategy for saving money it may not be the best strategy when it comes to symptomatic management of patients with hypothyroidism! Does this mean that you need to run out and try to change your thyroid medication from Synthroid to Levothyroxine or vice versa? Not necessarily, but it never hurts to be informed and educated on the topic. Instead of jumping to changing your medication it may be a good idea to sit down and evaluate your current situation. If, for instance, you are currently taking Levothyroxine and you are having trouble with hypothyroid symptoms (such as fatigue, weight gain, cold intolerance and so on) then it may be worth considering altering your medication. If you fall into any of these categories then you may want to consider changing from whichever medication you are currently taking to the other. So if you fit the criteria on the list and you are taking 100mcg of Levothyroxine then you would want to switch to 100mcg of Synthroid. You would then want to make sure that you check your thyroid lab tests after about 6 weeks to ensure that you did well with the transition. Most physicians should not give you any trouble in making this type of switch, but they may give you trouble if you asked to be switched from Synthroid to another medication like Armour thyroid. Another factor to consider is the cost of the various forms of T4 medications. Unfortunately, the cheapest medications tend to be Synthroid and Levothyroxine. The more expensive medications (which may be necessary for some people) tend to be upwards of $30 per month all the way up to $130 per month in the case of Tirosint. It's important to remember that the cost of medications often depends on which pharmacy you go to. Some pharmacies are just inherently more expensive than other pharmacies, even for the same medication. Also, in some cases, it may be cheaper to pay the "cash price" for medications instead of your insurance co-pay. Below you will find the average cost of a 30-day supply of 100mcg of each of the Thyroxine medications. Synthroid and Levothyroxine tend to be the same price, but often your insurance may cover one and not the other. If you fall into this category then you can usually pay the "cash price" and still pay the same total price. 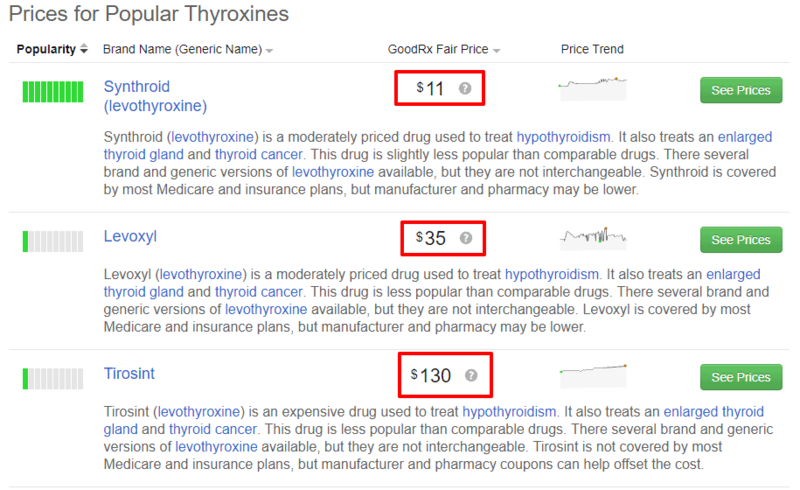 Tirosint is the most expensive T4 only thyroid medication coming in at around $130 per month for the 100mcg dose. Even though Tirosint is more expensive than other medications there are some coupon options that you can use to help reduce the cost. Levoxyl is another T4 only thyroid medication which is slightly more expensive when compared to Levothyroxine but cheaper than Tirosint. Each of these thyroid medications falls into the class of "Thyroxines" which means they all contain T4. Even though they all contain the same medication, you may find that you do better on one versus the other. Because of this, you may need to "play around" with which medication you are using. In some situations, you may find that switching from Synthroid to Levothyroxine (or vice versa) still doesn't help remove all of your symptoms. What are you supposed to do if you fall into this situation? First is to not lose hope or faith! You still have many options worth considering. #1. Try 50mcg Tablet of Levothyroxine/Synthroid - The 50mcg tablet has the fewest amount of inactive binders and fillers compared to other dosages. If you are taking 100mcg of Synthroid you may find benefit taking 2, 50mcg tablets instead of 1, 100mcg tablet. #2. Consider switching from Levothyroxine/Synthroid to Tirosint​ - Tirosint is a cleaner thyroid medication with only 4 ingredients (3 of which are inactive ingredients). This should be compared to Levothyroxine/Synthroid which contain 10+ inactive ingredients. #3. Consider altering the time of day that you take your medication - Some individuals may find significant improvement in taking their medication in the evening compared to the morning. Some studies show people who take thyroid medication at night (6) have higher free thyroid hormone concentration in the serum. #4. Consider looking into medications that contain T3 (triiodothyronine) such as NDT (Armour Thyroid, WP thyroid, and Nature-Throid) - These medications may be preferred in individuals who have thyroid conversion issues and in those who still remain symptomatic despite normal thyroid lab tests. What is the Difference Between Synthroid/Levothyroxine & Liothyronine? Synthroid and Levothyroxine are both considered T4 only thyroid medications which means that they contain the bio-identical thyroid hormone Thyroxine. Liothyronine, on the other hand, contains the most potent thyroid hormone which is known as T3 or triiodothyronine. T3 is about 3-4 times more powerful than T4 (depending on which study you look at). T3 is available in two medications: Liothyronine (generic) and Cytomel (brand-name). Many physicians and Doctors are hesitant to prescribe T3 due to the relatively short half-life of T3 when compared to T4. In addition, because T3 is more potent than T4, patients who use T3 tend to have more side effects. But these are not reasons to completely avoid this medication! Liothyronine may be a superior medication when it comes to weight loss and may be necessary for certain individuals. You can learn more about T3 in this post. There is a potential difference between Levothyroxine and Synthroid but the difference is probably not noticeable for most people. If you are currently taking one or the other and you are doing well (meaning you are not symptomatic) then you probably don't need to worry about changing up your medication regimen. If, on the other hand, you are taking one and NOT experiencing relief in your symptoms then the information in this post may be especially relevant for you. 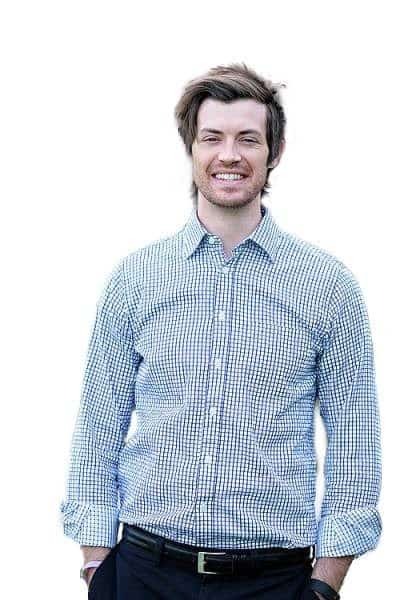 In this case, you may find relief in simply switching from name brand to generic or vice versa. Are you currently taking Synthroid or Levothyroxine? Are you still symptomatic despite normal thyroid lab tests? Has switching medications helped you feel better?